Oops! The Daily Blend is taking a little vacation. For now, you can visit the Valley of the Blabs. Rename your favorite junk foods in our Blend-In Poll . Fresh game reviews and tasty shareware over yonder. 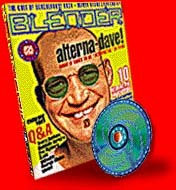 From Dance & Trance to the Highly Unusual -- Blender's disc reviews, as well as our Music Features. Love or hate it, it's the Hype! Report. While you're there, check our Reader's Messages of Love and Hate! All the letters of the alphabet, available now in Pop Speak from the Best of Blender Reader. BlenderWeb is best viewed using Netscape 2.02 or higher. Copyright © 1996 Felix Dennis. Questions, comments?